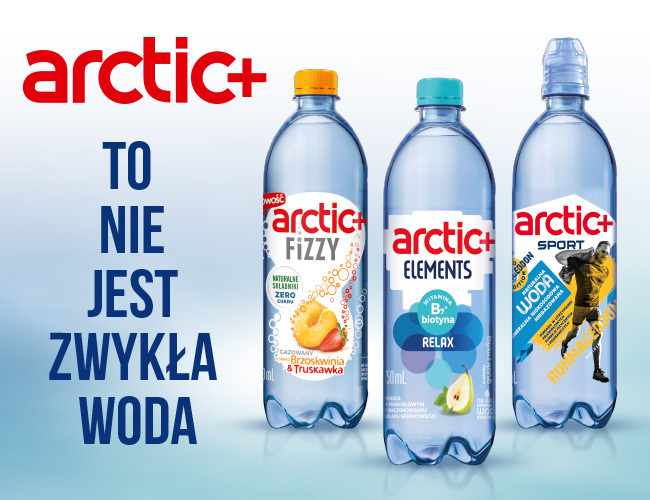 Arctic + is a water brand well known to consumers on the Polish market. Its portfolio includes natural, low-sodium water, with a balanced mineral composition that perfectly refreshes and quenches thirst. It comes in a carbonated and non-carbonated version in a 0.5 liter bottle and a 1.5 liter bottle, as well as a 0.75 liter variant for athletes with a practical sport cap closure, especially convenient during training. The brand’s offer is supplemented by the Arctic + Isosprint line of isotropic beverages and the flavored functional beverages of Arctic + Elements, as well as the novelty – Arctic + Fizzy – natural drinks based on sparkling water and aromas from fruit, sugar free, sweeteners, preservatives, dyes and artificial flavors.